Sculptorvox is a 7 volume series containing written and photographic contributions that have broadly and creatively interpreted, discussed and responded to a theme by exploring associations, presenting stories and constructing narratives, with each volume produced as a limited print run. ‘Geometry of Nothing’ is the inaugural volume in this series. It explores a variety of concepts around contemporary sculptural practice. It casts an eye at some of the fundamental aspects of ideation, process, spacial-relationships, interaction. The idea that the creative process is ‘ex nihilo’ – something from nothing – speaks to the origins, drives and outcomes generated by the artist’s compulsion to create physical, tangible and virtual objects, realms, realities and dialogues. Sculptorvox’s vision is to create a one-time, collectable publication series dedicated to the appreciation of contemporary art practice within the broadest notion of what sculpture means today; featuring interviews and profiles of the most innovative contemporary artists working in three-dimensions. As with all creative processes Sculptorvox features the influential work that feeds the careers, lives and output of contemporary artists with inspiring photographic work, journalism, new writing and influential viewpoints. 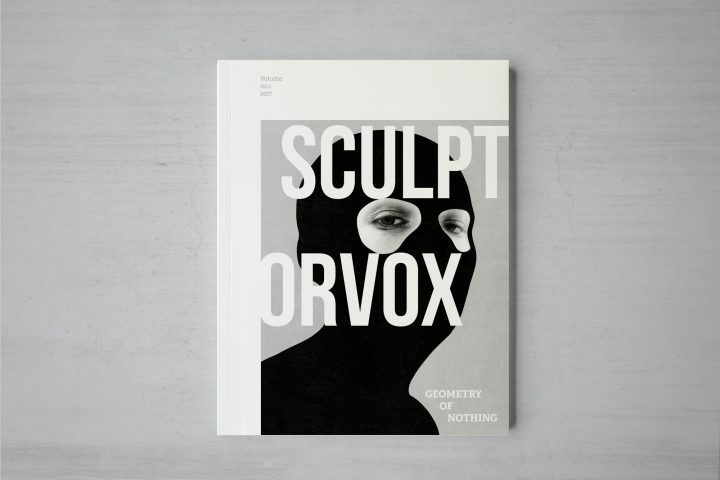 Sculptorvox is an independent publication produced by Urban Fugitive as its sole endeavour. In conjunction with the notion of the slow web, through print based publishing Urban Fugitive provides a complementary format for a slower, more considered consumption of information both visually and textually. Urban Fugitive are a small independent publisher creating a lasting, physical, tangible and viable alternative through beautifully crafted niche publications. Approx 150 pages, 215 x 280mm. Perfect Bound. I've suggested that both DJ-ing and traditional curating involve organising individual works together to be more than the sum of their parts and to speak to people individually and as a whole. I’ve heard the relationship between curator and artist described like that between a cat and a mouse, cats preferring the chase to the capture. The suggestion is curators like to discover artists rather than have artists approach them. That is interesting for me an artist. For #r3fest 2018 – In Exile, James delivers messages electronically in the form of a running related quote displayed randomly from a collection of contributed quotes when visiting: www.jamessteventon.com/in-exile/the-only-running-footman. "It’s like watching a chrysalis become a butterfly: The prototypes are impressive, but the kouros is timeless; he might be about to breathe, move, speak ... Even in relatively static positions, the implication of movement is the transfiguring achievement of these classical figures."